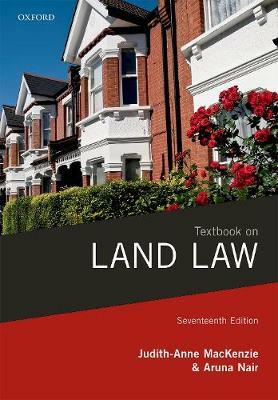 Practical and contextual in its approach, lucid and engaging in style, Textbook on Land Law enlivens the subject for students. The innovative running case study used throughout illustrates the law in action, helping students to visualize the real life applications of the law and demystify abstract concepts. Academic details on key topics are explained straightforwardly for an accessible learning experience. This is enhanced by additional examples, extracts, diagrams, and sample documents which contribute to the building blocks of a clear framework, enabling students to gain a pragmatic understanding of the essential principles. A glossary of key terms is included at the end of the book for ease of reference, while end-of-chapter reading suggestions support further research and exam preparation. Online resourcesThis textbook is also accompanied by online resources including self-test questions with instant feedback, guidance on approaching land law problems, as well as additional examination of topics such as leasehold covenants, perpetuities and accumulations, and undue influence and mortgages.